I was first introduced to Iron Maiden’s music in 1982, when the song “Run To The Hills” started getting airtime on the local radio station [KMET 94.7 in Los Angeles]. In 1983, they released the album “Piece of Mind” which I played non stop for several days. It cemented my love of Iron Maiden and to this day, I still play and album or two a week. Recently, they released a new album called “The Final Frontier”, which like most of the previous fourteen studio albums, proved that this band still had the metal sound I embraced years ago. Tracks like “El Dorado” “The Talisman” and “Mother Of Mercy” are full of time-tested riffs and rhythms that are familiar to these ears. Their last album “A Matter Of Life And Death” was 10 tracks deep and when it was released four years ago helped the band regain a status of being one of the biggest heavy metal bands around. I am a HUGE Maiden fan, and now I love you even more for this post! I really need to get more into Maiden. I only know them tangentially. They weren’t a huge deal for me growing up. I was more of a Megadeth and Anthrax fan. Where should I start? 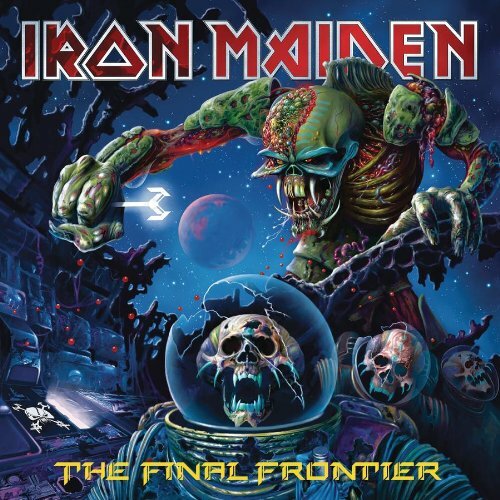 After playing it for a couple of weeks I think The Final Frontier is a really solid Maiden album. I do agree that it’s not really up there with their classics but still a worthy addition to any Maiden fan’s collection. sybil law – Nice. I figured you were a Maiden fan. kapgar – Best album to start with, IMO, is Somewhere In Time. Then Brave New World, then Seventh Son Of A Seventh Son. Then anything after that, song wise… Run To The Hills, Number of the Beast, 2 Minutes to Midnight, Aces High. All really good tunes. tori – Yeah, another Maiden fan. kevin – As our tweeting about Maiden, this post lets others know you were a long time Maiden fan. The new album is pretty solid.